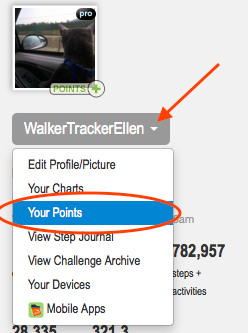 Points competitions are a great way to reward for all sorts of metrics, including walking! If you are in a points competition it is important to understand what earns you points. To find out what this may be, visit the help section of your site or click on your username next to or below your profile picture. This will pull up a drop down menu, click "Your Points". 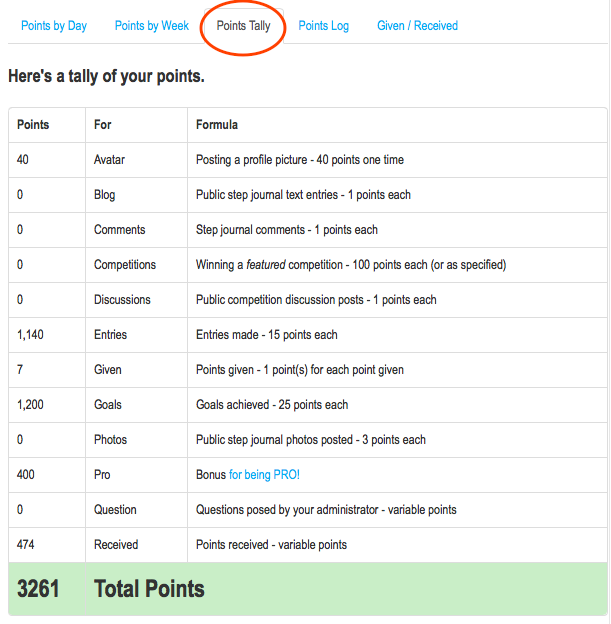 To get a great explanation on our Points System click on "About Points". To find out what you need to do to earn points click on "Points Tally" to pull up the chart that will show you what you earn points for (below is only an example and this may look different according to your program). Make sure to complete each task daily/weekly to earn the maximum amount of points. In your competition your goal is to achieve a certain number of points within a certain period of time. This can only be done by completing each task on your Point Tally sheet. Sometimes you can get more points through the Giveaway Points System. *Each time you make a step entry, you will be rewarded 2 points that you can giveaway to other walkers. * Every time you give a point to someone, you get one in return. This is not included on the Points Tally sheet and can give you an edge up on points within the system (NOTE: Giveaway points may not be turned on in your program). 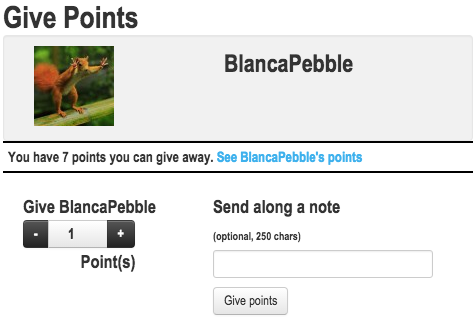 To giveaway points, click on the username of the person you would like to give points to. Click on the + sign by their profile picture and then select the amount of points you would like to give and if you'd like, send along a note. The points system is all about participation in the site and with each other. It's there to reward your diligence and commitment to health and the walking program. Enjoy and have fun with it!